A few months ago, I came across a Periscope channel that broadcasts live videos of foxes at a sanctuary. I immediately became a regular viewer of these videos. Mikayla Raines rescues foxes from fur farms and provides them with a better life at her fox sanctuary in Minnesota. Most of the foxes come to her as young cubs who have been rejected by their mothers in the fox farm, where conditions are harsh. Mikayla bottle-feeds the cubs and raises them to adulthood. They live in spacious enclosures and have daily exercise and playtime in a large fenced area of woodland. All her foxes are spayed or neutered, receive regular vaccinations and parasite treatments, and are fed on grain-free cat and dog food, fresh meat, and fruits and vegetables. Some of the rescue foxes are eventually adopted as pets by suitable, responsible owners, while others remain in the sanctuary and are sponsored. Foxes are members of the canine family, but in some ways are more similar to cats. They are not pack animals like wolves or dogs, so it is difficult to train them, as training depends to some extent on an animal's instinct to obey the pack leader. It is illegal to release foxes born on fur farms into the wild, because they are descended from many generations of foxes raised in captivity, and therefore would probably have trouble surviving in the wild. They lack the experience and instincts to live wild, and their dependence on humans creates two dangers: an inability to fend for themselves and at the same time the risk that their trust could lead them to be harmed by humans who view them as a threat. This is why the rescued foxes need to continue living with humans, either in a sanctuary or as pets. I have always found the idea of wearing fur abhorrent. The use of animal furs may once have been necessary for survival, but we now have a wide variety of warm materials to use and no longer need to breed and slaughter animals for the sake of clothing. 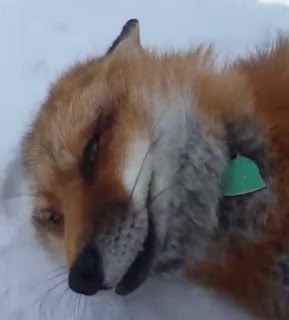 The conditions in which the foxes are kept on fur farms only make this worse. They spend their entire, short lives in tiny cages, never able to run free. Of course, I also oppose fox hunting. Mikayla is an inspiring role model of an animal rescuer. She started working in animal rescue as a teenager, and currently lives very modestly in a cabin with no electricity on the grounds of her sanctuary. She runs her rescue on donations from followers around the world. Her Periscope broadcasts show her devotion to foxes, her expertise in raising them, and her patience in answering viewers' questions and educating the public about foxes. In the next few weeks, Mikayla plans to rescue additional newborn fox cubs from the fur farms and raise them in safety. She will devote hours to bottle feeding the cubs, gradually training them to use the litter box, to play and interact with other foxes and with dogs and cats, and to walk on a leash. She sometimes has volunteers helping her, but usually she works alone, maintaining a large rescue by herself. Readers who would like to help can donate money or even sponsor a fox regularly. Watching this Periscope channel has taught me about another aspect of human-animal relations. Foxes are not domesticated animals, and ideally they should live in the wild and be protected. The public needs to be educated about foxes and how to interact with them. If fur farms eventually become illegal, the foxes that remain there will need to live out their lives in sanctuaries like Mikayla's, or as pets, and eventually there would be no need for humans to breed foxes for any purpose (including as pets), and they would revert to their natural status as wild animals, more like the various species I watch on SafariLive. In contrast, cats have been domesticated and ideally all cats would live as pampered pets. Until that can happen, feral cat colonies should receive regular feeding and medical care, and be spayed and neutered through TNR programs to reduce their numbers and prevent the suffering of unwanted kittens born in the wild. The various animal-related channels I have been watching have taught me so much about animal rescue, welfare, and conservation, and about the compassion and empathy of the people involved in such work. I would like to hope that the work of Mikayla and other animal rescuers can inspire others to greater compassion.